restylingmag.com March 2015 | Restyling & tRuck AccessoRies 11 posts to YouTube with informative videos, like how to install window tinting , and entertaining videos, like the one with the staff doing the Harlem Shake dance move. "We take pride in the fact that we are No. 1 on Google when people are searching for window tinting car audio in the OKC region," says Kelley, the operations manager. "We recognize that's how people shop these days. ere's no more Yellow Pages, so we have to be at the top of the search page." 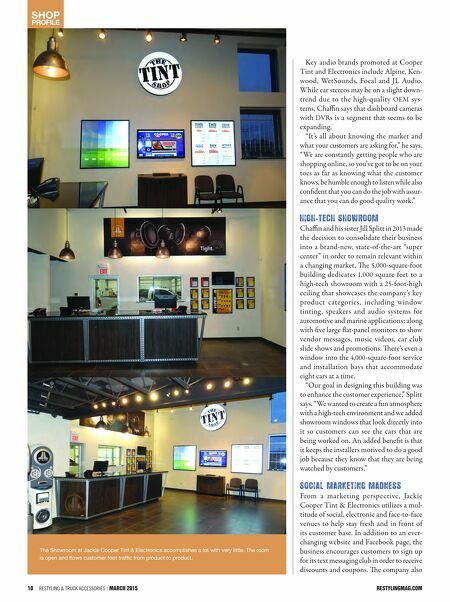 Jackie Cooper Tint & Electronics makes great effort to stay visible within its com- munity. Local car clubs are invited to take over the shop parking lot to showcase vin- tage classics. Also, a monthly on-location, three-hour broadcast by a popular sports radio talk show allows the Jackie Cooper Tint & Electronics pros to talk about cars, answer questions from listeners and pro- mote specials. Most important, Splitt says, is estab - lishing a special customer experience for visitors of the shop. " We have a fantastic clientele and get a lot of business through referrals," she says. "We use an online scheduler to keep track of our appointments that also helps us send reminders a day ahead of time and follow up with thank you notes aerward. We strive to develop a great relationship with them because we know that if they have a good experience here they will keep coming back." Just like your mother would have wanted. The installation bay at Jackie Cooper Tint & Electronics is usually packed.